red cabbage with codfish. This is a common dish in Astorga (León) the Way of St. James. 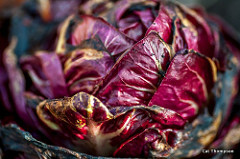 Red cabbage is in season from June to St. James Day, July 25. Medicinally, a bruised leaf mixed with egg white was applied to red, sore eyes overnight to relieve them. Heat a large skillet over a medium-low heat and cook the bacon in the olive oil until lightly crisp and most of the bacon fat renders, about 5 minutes. Drain all but a thin layer of the reserved fat from the pan, and reserve for cooking the fish. Add the onion to the pan, and cook, stirring until wilted, about 3 minutes. Stir in the cabbage and cook until wilted, about 2 minutes. Add the water, mustard, vermouth, thyme and allspice, and season with 0.5 tsp salt and pepper, to taste. Cover and cook until soft and fragrant, about 8 minutes more. (This can be done up to 1 hour ahead and then reheated, covered, to serve.) Pat the fish dry and season with the remaining 0.5 tsp salt and pepper, to taste. Heat a large nonstick skillet over a high heat and add the reserved bacon fat to the pan. Lay the fish, skin-side up, in the pan and cook until golden brown, about 6 minutes. Turn the fish over and continue to cook over a medium to medium-high heat until the fish is opaque but not flaking, about 4 minutes more. Divide the cabbage among 4 plates, place the fish browned side up on top and drizzle any juices over the fish. Serve.